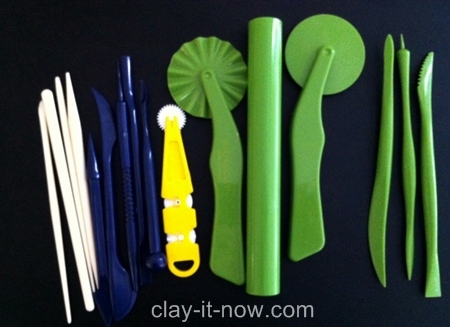 Essential clay tools are needed to create professional looking clay model. There are hundreds of tools available in the market to choose from but many of them are not necessary. The key for successful craft is not from the extravagance tools but from your understanding on how to use that tool to help you to create something. 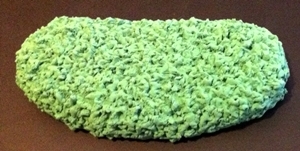 Plain Non-Stick Rolling Pin: for rolling out clay. Some artist prefer professional clay machine or pasta machine. But if you just started you don't need it. Cutting Wheel: to make a smooth cut on long pieces of clay. You can use pizza cutter from your kitchen if you don't have clay cutting wheel. Tracing Wheel: I name it that way because it's really look like a tracing wheel use to trace the cloth pattern. The tool has serrated teeth on a wheel attached to a handle to make slotted perforations (yellow color). Knife Tool: cutting and marking the clay. Smiley Tool: This is essential to create a smile line, eyelids and fish scales. Don't have the tool? No worries! Cut your drinking straw in various size along its diameter and you'll have a crescent for smile line. 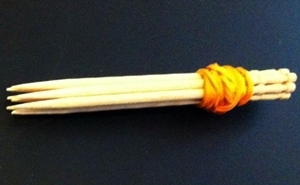 Tapered Cone with Pointed End: This tool is commonly used to hollowing up the bottom of sleeves or legs, making holes, etc. Texture Stick: I used this tool to create lines on flower petals or for making lace. Small Pointed/ Needle Tool: I used this for nostrils or making holes. You can also use needle, toothpick or fork. Ball Tool: For making a hollow space or creating depth. Scissor: It is an essential tool and used very often. DIY Wool Texture Tool: The best DIY (do-it-yourself) texture tool to create an impression of wool or carpet is made of toothpicks. Pick about 5 to 10 toothpicks and tight them together. Poke you clay in circular motion to create nice texture. It's cheap and easy, isn't it? How will it look like when you use the above clay tools? When it comes to decision about buying clay tools, you may be overwhelmed with wide selection of tools and price. My essential clay tools which I'm happy to recommend to you are 3 pieces basic tools from Makin's clay. You'll see me using these green colour tools in most of my YouTube video tutorial. It works and not expensive.